Today marks the release of Movable Type 4 (MT4) beta version! By the way, MT is an alternative to the popular WordPress blogging platform. It is developed by Six Apart. MT4 is believed to target business bloggers and further expand its market share. Currently Six Apart is already having some enterprise customers such as Intel Corp., Oracle Corp., Boeing, The Washington Post and New York University. Movable Type 4 has been rearchitected to simplify companies’ management and deployment of corporate blogs and the creation of online communities, Six Apart officials said. I’m sure many of us are thinking of upgrading our computer operating system to the latest Windows Vista. 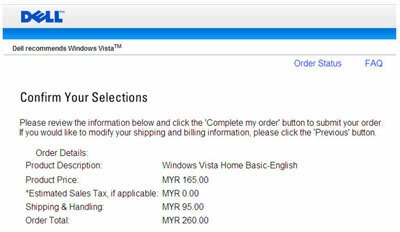 Apart from wondering will the current computer hardware be compatible to Windows Vista, probably we are facing the dilemma of choosing which version of Windows Vista. Basically, there are 5 versions of Windows Vista to choose from, they are Home Basic, Home Premium, Business, Enterprise and Ultimate. 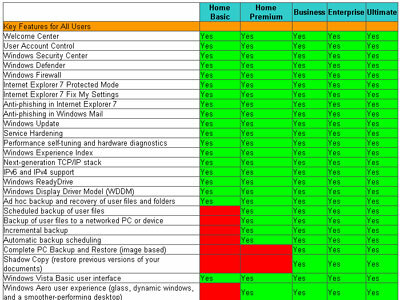 This is the link to a comprehensive comparison chart of all 5 versions of Windows Vista. Hope it helps you to make your upgrading decision. I’ve come across this interesting movie clip called The Google Master Plan in Youtube quite some time ago. It’s a movie directed and produced by Ozan Halici & JÃ¼rgen Mayer for their Bachelors’s Thesis at the University of Applied Sciences Ulm, Germany. The movie basically talks about how Google can use their free services like Google Search and Gmail with their gigantic database for some known, and possibly unknown, purposes. Well, it talks about our privacy as users of Google free services as well. Needless to say, it got me ponder how powerful Google is nowadays. Check out their The Google Master Plan website. There are some different video formats of the movie ready for download too. Is Your PC Windows Vista Capable? I bet all PC manufacturers are now bundling their computer with the latest Windows Vista operating system (OS) since the launch of the OS early this year. Most of the new PC are now built/designed for Windows Vista, but what about old PC that we are still using right now? The cost is reasonable, but what I was more curious is how efficient will my laptop become after upgrading to Windows Vista. Hafiz Ismail, the author of Smart2Go review I posted last week, has done another excellent review with a couple of video shots. If you have not downloaded the well written review, it is still available here (PDF, 573KB). While a picture speaks a thousand words, a video speaks tenfolds more I would say. Below are the supplement videos he generously provided. Beware if anyone of you downloaded a cracked version of the forthcoming Windows Vista from any online sources, including BitTorrent. The program claims to be a “crack” designed to unlock pirated copies of Vista, which was made available to Microsoft’s volume licensing customers last week. The cracked file named “Windows Vista All Versions Activation 21.11.06” actually contains a password-stealing trojan horse known as Trojan-PSW.Win32.LdPinch.aze. Kaspersky is one of the antivirus applications manage to detect the trojan horse, but not Norton Antivirus and Eset’s NOD32, says the security researchers. So, be extra careful if you are using any of these 2 antivirus.